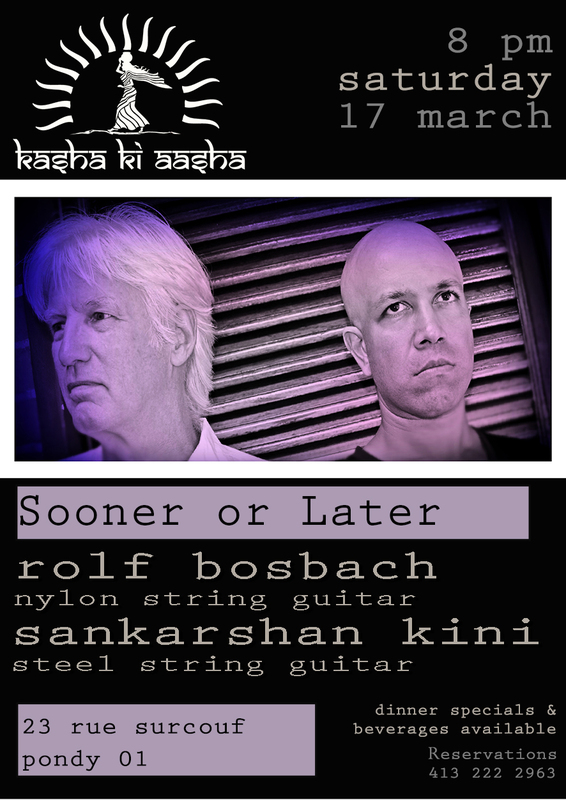 This weekend Kasha Ki Aasha is proud to present SOONER OR LATER – guitar duo Rolf Bosbach and Sankarshan Kini. This is their first performance as a duo at Kasha Ki Aasha and we are looking forward to an evening of Rolf’s original compositions. Shanks continues to surprise us with his versatility as a musician as well with the talents he brings to our stage to play with. 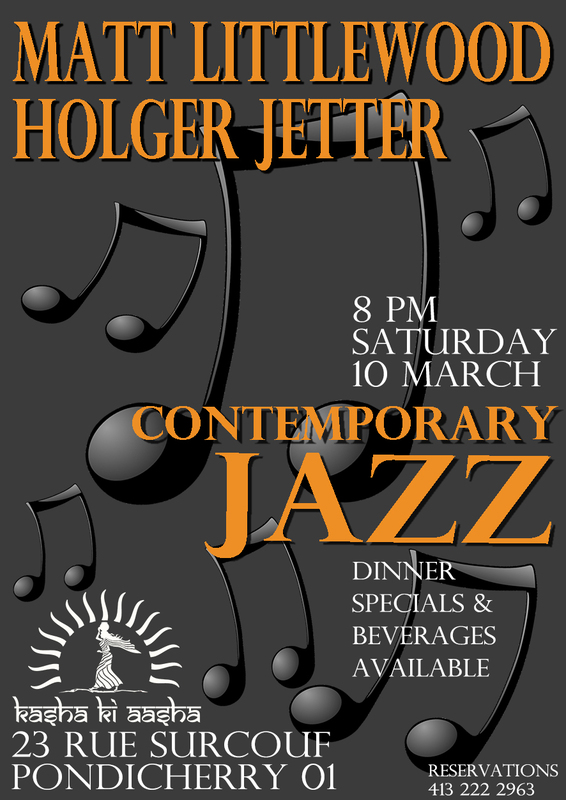 This Saturday will be a very unique evening of jazz. Music starts at 8 pm. Call to reserve at 413 222 2963. Rolf was born near Cologne in Germany. His interest in eastern philosophy and yoga brought him to Auroville in the mid ‘90s. His original compositions are a reflections of personal experiences or inspired by the poems of a close friend. He grew up with the Beatles, Progressive Rock and Jazz-Rock and only developed interest in jazz when he had to play it in various Bands in Germany and Auroville. He organises several shows a year in Auroville bringing musicians together. 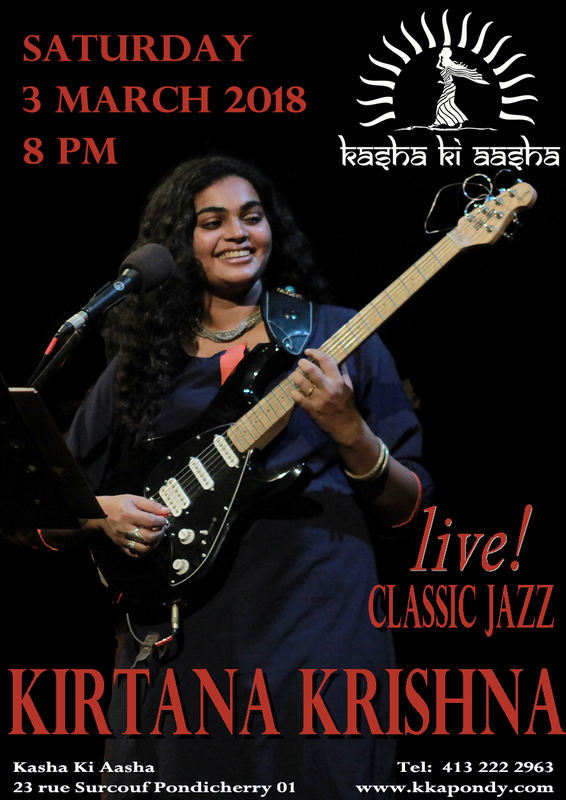 This Saturday evening we welcome KIRTANA KRISHNA to Kasha Ki Aasha’s Terrace for an evening of Classic Jazz. 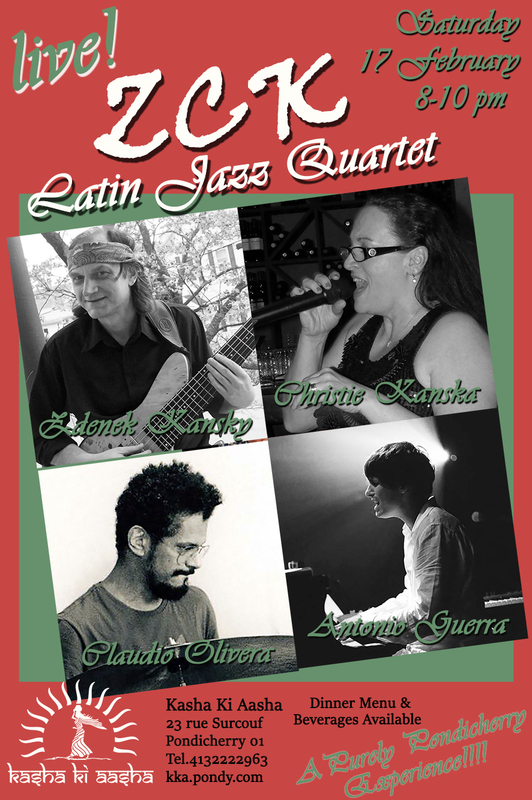 Kirtana will perform your favorite jazz classics on guitar and that amazing voice we adore! 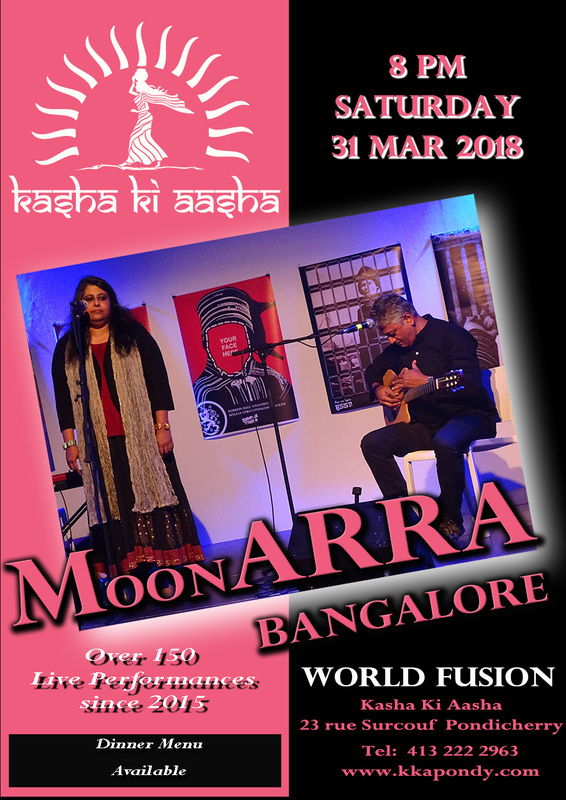 Don’t miss another evening of great music, great people and great food at Kasha Ki Aasha. Music starts at 8 pm and you can reserve a place by calling us at 413 222 2963 anytime! Kirtana Krishna, originally from Bangalore, trained at the Swarnabhoomi Academy of Music and now performs regularly across India solo and with a number of established musicians! 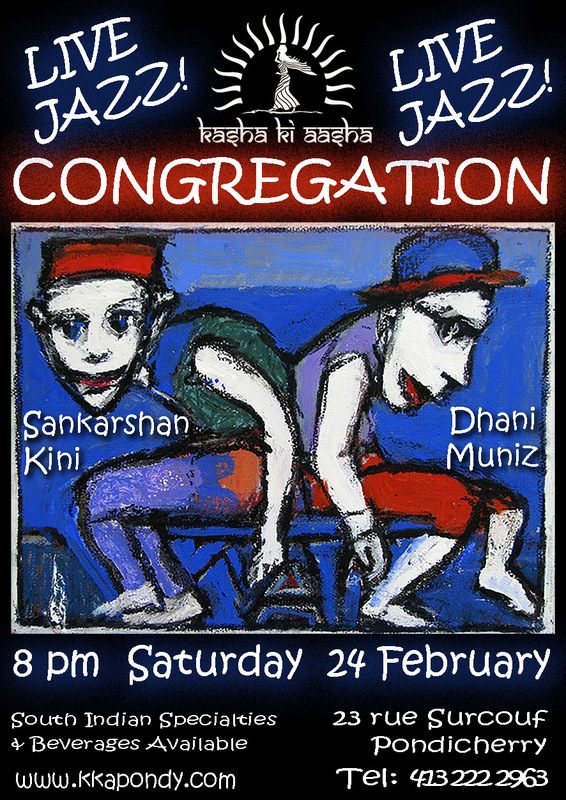 Come join CONGREGATION this Saturday at Kasha Ki Aasha for their very special jazz sound by guitarists Dhani Muniz and Sankarshan Kini. Dhani is one of the great discoveries in our region and this is only his second performance ever. You will not want to miss this duo’s amazing guitars. Music starts at 8 pm. Kasha Ki Aasha is at 23 rue Surcouf in Pondicherry. Call us at 413 222 2963 for reservation. 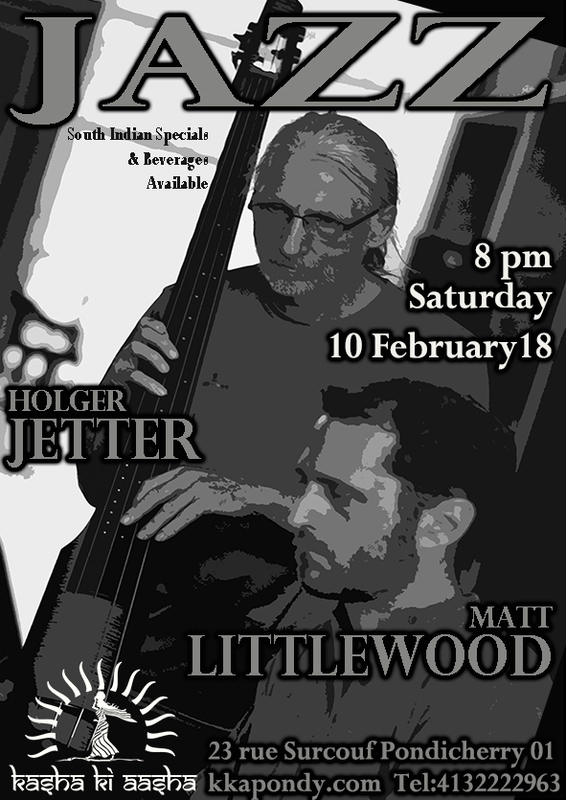 Kasha Ki Aasha presents Matt Littlewood on keyboard and Holger Jetter on Strings this Saturday evening at 8 pm. This duo bring the best of contemporary and classic jazz to our garden terrace on a regular basis because their performances are always something extra ordinary! Join us for an evening of great music, great people and great food. 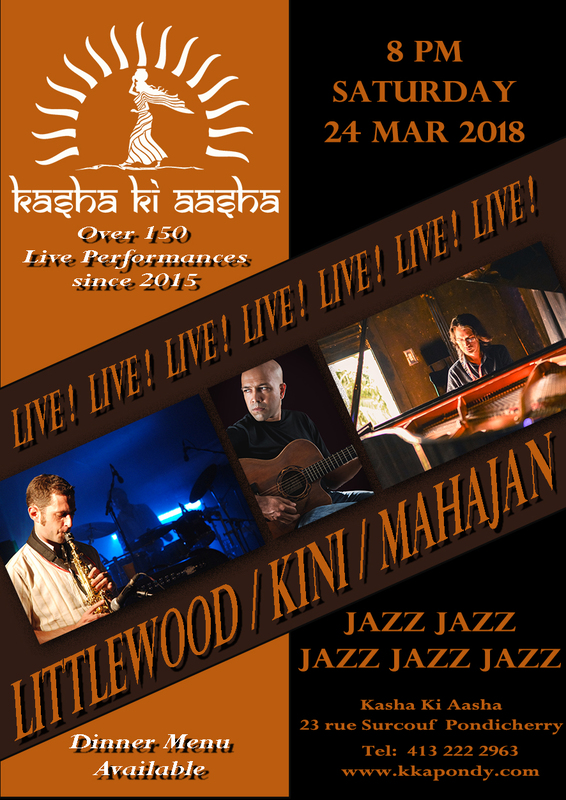 Kasha Ki Aasha is the only venue in Pondicherry offering live music every single Saturday since 2015 and we do it in a way you will never forget! Music starts at 8 pm Reservations are welcome at 413 222 2963. Kasha Ki Aasha is located a hop, skip and a jump over the canal from the French Quarter at 23 rue Surcouf, Pondy 01. See you Saturday! 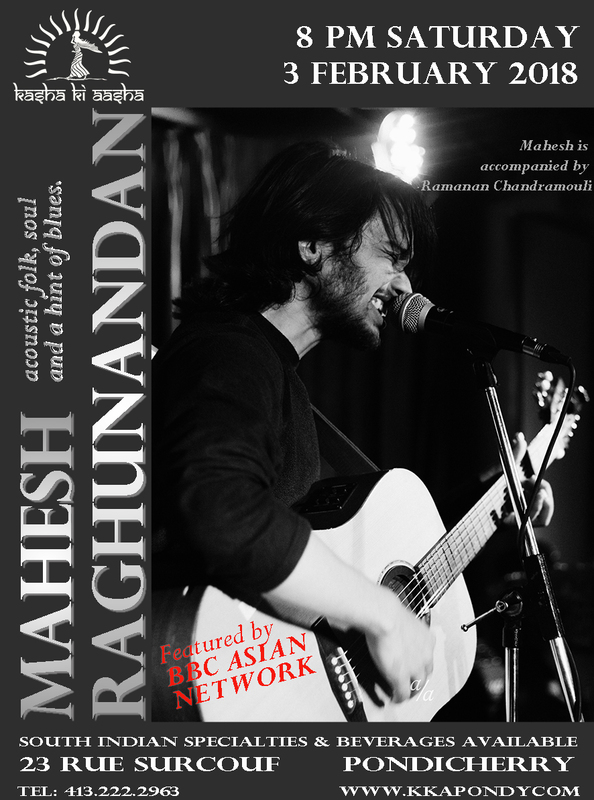 Kasha Ki Aasha welcomes back Bangalore based singer songwriter Mahesh Raghunandan to our terrace this Saturday. Mahesh, whose music combines indie folk, folk rock, pop rock and soul along with a hint of blues will be accompanied by musician, Ramanan Chandramouli for the performance which starts at 8 pm. Come join us for yet another night full of great music, great food and great people on our terrace. Music starts at 8 pm and keeps rolling to 10 pm. South Indian specialties and beverages are available. We are happy to take your reservation at Tel: 413 222 2963. See you soon at Kasha Ki Aasha 23 rue Surcouf, Pondy 01!!! Mahesh Raghunandan is influenced by artists ranging from Ray Charles, Stevie Wonder, Frank Sinatra all the way to John Mayer, Damien Rice, and has opened for artists such as The Raghu Dixit Project, Bruce Lee Mani (Thermal and a Quarter), Parvaaz, The Kutle Khan Project, Sanjeev Thomas & Baiju Dharmajan and international artists such as Lucy Rose, Luke Sital-Singh from the U.K and Ty Penshorn from Australia. Mahesh also performed as a singersongwriter at Bacardi NH7 Weekender 2015, Stage42 Festival 2016, Into the Void 2016, Bacardi NH7 Weekender 2017 and more. He has performed with Christian Galvez, one of the best Jazz musicians in the world. Besides the solo career, Mahesh is involved in multiple collaborative projects. He is the frontman of the psychedelic/alt band Blushing Satellite. Ramanan Chandramouli is a Los Angeles Music Academy (LAMA) graduate who has played guitar alongside Brad Rabuchin (Ray Charles), Philip Bynoe (Steve Vai), Tim Curle (Josh Groban) and has extensively toured the United States/Dubai/Malaysia. In India he has performed numerous times with Thermal and a Quarter, Lou Majaw, Adil & Vasundhara to name a few and has opened for the legendary John Mclaughlin from Shakthi and Mahavishnu Orchestra.